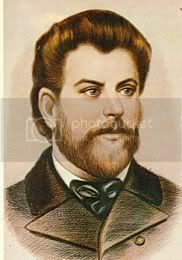 Ion Creanga was born on March 1, 1837 (according to him) or June 10, 1839 (according to some writings from the Humulesti maternity) in HUmulesti, Neamt, Romania and died on December 31, 1889. He was a talented and one of the most famous writers in Romania. His parents' names were Stefan and Smaranda Creanga. He is one of the 8 children of his parents.Between 1846 and 1853 he attended school in his birth-town. After that he continued studying at Princely School in Targu Neamt.One year later his mother wanted to see him a priest so he went to the Catechetical School in Falticeni.Unfortunately the school in Falticeni was abolished and he went to Iasi where he became student of the theological seminary "Veniamin Costachi" in Socola.In 1859 his father died and in the same year hemarried Ileana, priest Ioan Grigoriu's daughter. He is ordained deacon at the Sfanta Treime Church.Titu Maiorescu appreciated and chose him to be teacher at the Primary School number 1 in Iasi.In 1860 his son, Constantin, was born and five years later his mother died of epilepsy.Between 1859 and 1872 he served the church as teacher and deacon in different churches in Iasi.On October 10, 1872 he is expelled from the clergy because his wife abandoned him and he used a gun to shoot the crows.For 25 years he was a great teacher and wrote with other teachers four handbooks.In 1873 the court took a decision in his action for divorce and gave him the child.He lived in Ticau and chose Tinca Vartic as housekeeper. He also chose her as a woman and lived with her until his death, even though they didn't get married.He met Mihai Eminescu in 1875 and they soon became friends. With his help Creanga became a writer.For six years between 1883 and 1889 he had suffered of epilepsy and found out from the newspapers that his friend Eminescu was ill and then that he died. Finally he died in December 1889. Most Important Writings :- Soacra cu trei nurori- Punguta cu doi bani- Danila Prepeleac- Povestea porcului- Mos Nechifor Cotcariul- Povestea lui Harap-Alb- Fata babei si fata mosneagului- Ivan Turbinca- Povestea unui om lenes- Amintiri din copilarie- Popa Duhu- Cinci pâni- Mos Ion Roata- Mos Ion Roata si Voda Cuza.